X-ray crystallography is one of the most exact experimental techniques, but ironically, it is also one that relies on sheer luck. With crystallography, we can determine the location of each atom in a protein, allowing us to explore the nanoscale details of our molecular machines. Crystallography, however, relies on crystals, and protein crystals are notoriously difficult to grow. For decades, crystallographers have perfected their methods, and today, large systematic screens and automation have vastly improved the success rate for crystallization. Effective crystal-growing methods are particularly essential for structural genomics, since its goal is to determine structures for all proteins in a given organism. To achieve this goal, structural genomics researchers need to be confident that they can obtain crystals when they need them. However, many proteins still stubbornly refuse to crystallize, at least with existing crystallization methods. Researchers at CHTSB have been exploring a new way to grow crystals. They noted that in many cases, crystals are only obtained after particular "additive" molecules are included in the crystallization mixture. These may be small molecules like nucleotides or cofactors that bind in the active site and stabilize the protein. More provocatively, they may be molecules with several functional groups that form links between molecules, stabilizing the proteins in the crystal lattice. Unfortunately, these crystal-inducing additives are often discovered by serendipity, added to the crystallization liquor based on an intuition, or even left over from the process of purification. CHTSB researchers are now trying to be systematic about discovery of crystallization additives. They add a mixture of several diverse molecules to the crystallization liquor, improving the chances that one of them is the right shape and size. The trial additives are chosen for their properties: they are typically bristling with hydrogen-bonding, charged, and hydrophobic groups that interact with protein surfaces. In several large tests of proteins, these mixtures of additives have performed quite well, doubling the success rate of obtaining crystals. One example of the success of an additive mixture is shown here. Proteinase K was crystallized from a mixture that included three very different small molecules: an antiepileptic drug with two hydrophobic phenyl groups, an acidic sugar, and a nucleotide. The mixture also included the buffer HEPES, which has a several functional groups. The sugar was the winner. It helped coax the protein into a new crystal lattice, forming a bridge between the proteins. The lattice is shown here (PDB entry 3dyb), with the protein in blue and the sugar (digalacturonic acid) in red. The HEPES buffer also bound to the surface of the protein, as shown in green in the figure. 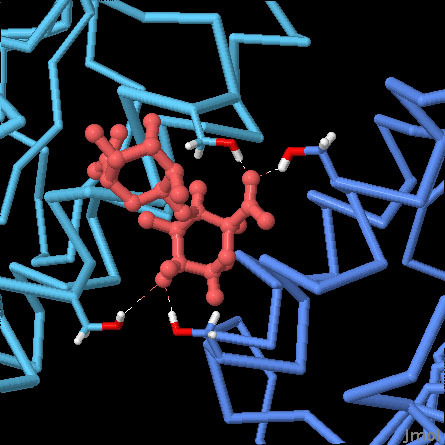 Digalacturonic acid, shown here in red balls-and-sticks, bridges between two proteins, shown in blue, forming hydrogen bonds with serine amino acids on both proteins. Use the buttons below to see a spacefilling representation and to change the colors. Larson, S.B., Day, JB., Nguyen, C., Cudney, R., McPherson, A. 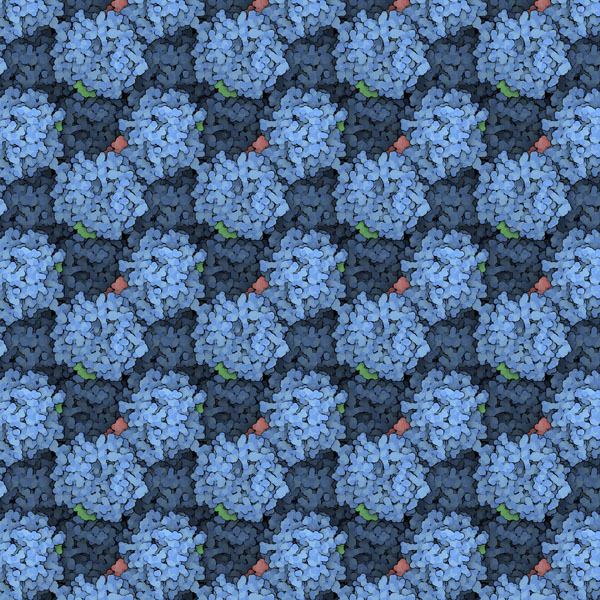 (2009) High-resolution structure of proteinase K cocrystallized with digalacturonic acid. Acta Cryst. F65, 192-198. Larson, S.B., Day, JB., Nguyen, C., Cudney, R., McPherson, A. (2008) Progress in the development of an alternative approach to macromolecular crystallization. Cryst. Growth Design 8, 3038-3052.